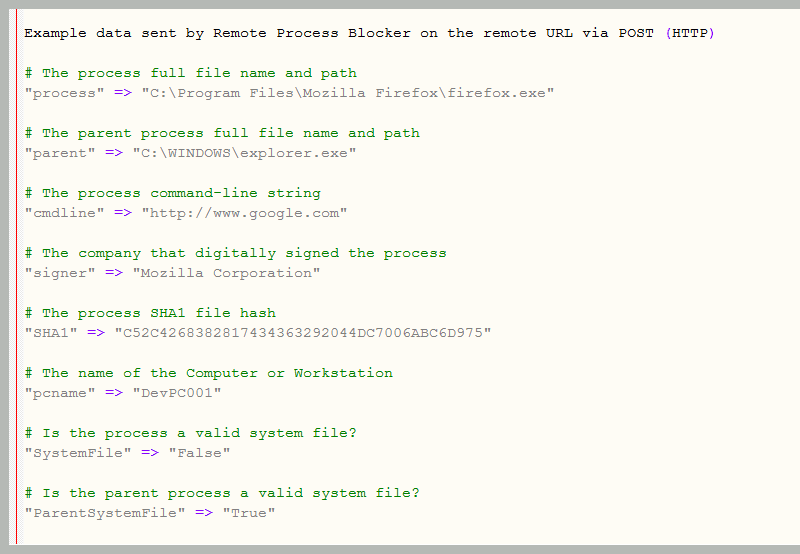 Remote Process Blocker is a framework that allows for advanced Windows users to intelligently block the execution of a spawning process based on serverside rules. The framework intercepts process creations and will wait for a response (execution allowance decision). Pattern matching, binary signature detection, behavioral heuristics etc. can be determining factors etc. in which you can implement in a custom fashion if you choose to. Once given an allow/block response the framework will either allow the program to run or block it from executing within the live system. You can create custom rules serverside to block or allow the execution of processes on Windows systems. You can install this tool in many workstations and control the rules from a remote or local server. Remote or local scripts may be used to retrieve responses from both HTTP and HTTP(S) hosts which can be configured. 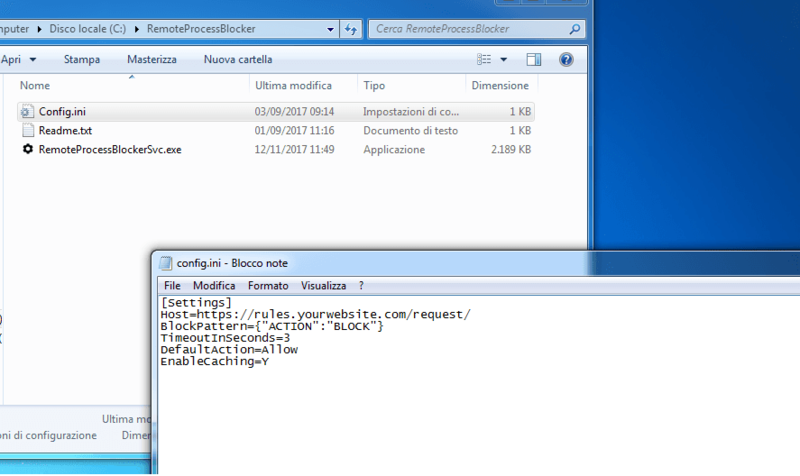 Caching of already allowed/permitted processes is also configurable via the portable .INI config file as well as other options such as the maximum wait/timeout value for responses (in seconds), a default action (allow/block) if a timeout occurs or other such errors such as destination unreachable etc. 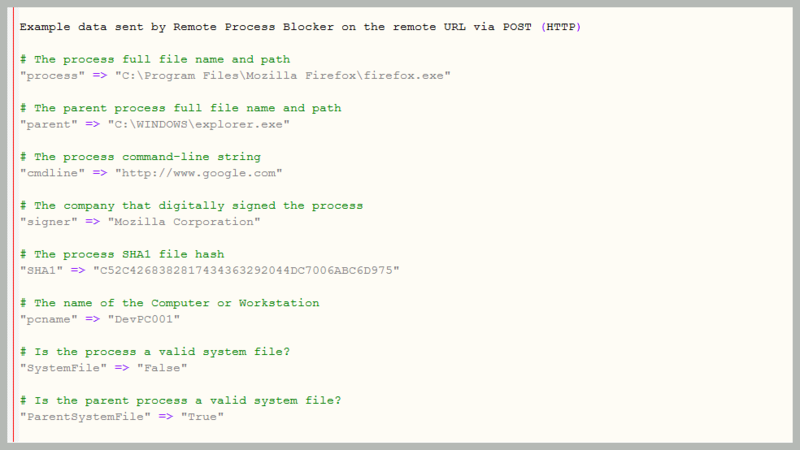 Write your own serverside rules to allow or block a process remotely. This tool queries (via HTTP or HTTPS) your server to know what to do. All process details are sent (POST) to your remote server for easy rules creation. Data sent includes process name, path, hash, signer, is_system_file, parent, etc. The program can retrieve responses from both HTTP and HTTP(S) hosts. An additional layer of protection to stop malware and online threats. This framework works on all Windows NT-based x86 and x64 Operating Systems.